RADIO INTERVIEW NOW LIVE ONLINE! If you missed our live radio interview last night with Luciana Faulhaber and Javier E. Gomez you are in luck! The link is NOW LIVE on their website! We jump in at minute 64 so start there. It's about an hr chat about movie making, horror movies and good laughter with America's Most Haunte. Perfect to listen to on your commute to work or while you get ready. Take a listen! THREE AWARD NOMINATIONS AT CRIMSON HORROR FILM FESTIVAL! We are headed to the acclaimed Crimson Horror Film Festival and we just received three award nominations! Thank you to the festival board and we cannot wait for the screening! OUR FIRST REVIEW IS IN! We are thrilled to share our first official Review! Click Below to take a look and hope you enjoy! WINNER Audience CHOICE AWARD at Rock Horror in RIO Festival! This is the sweetest one yet! Thank you to everyone who went and voted! We are over the moon! WINNER! BEST SPECIAL EFFECTS in TORONTO! We could not be more honored by this win! Congrats to the entire team! 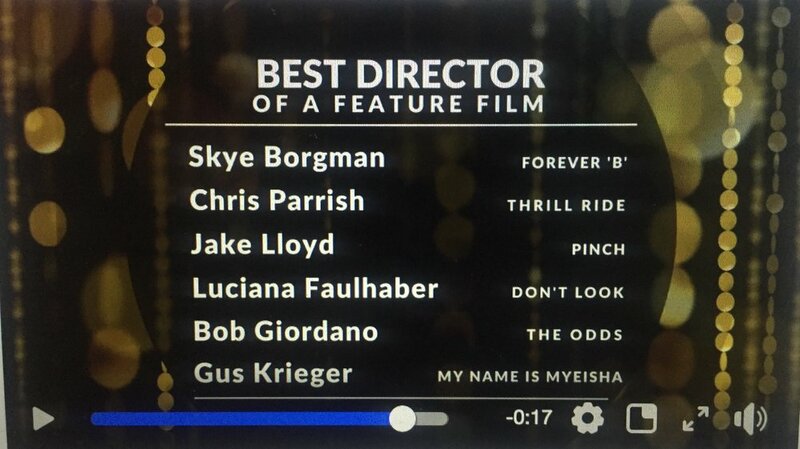 We were honored to have been nominated for best director! Join us for the Premiere March, 26th at 7:50pm! World Premiere Screening Tickets now on Sale! Buy a ticket and get also admission to after party! We are excited to announce we will have our West Coast Premiere at the North Hollywood! Premiere Screening Tickets now on Sale! Don't Look Wins It's First Award! 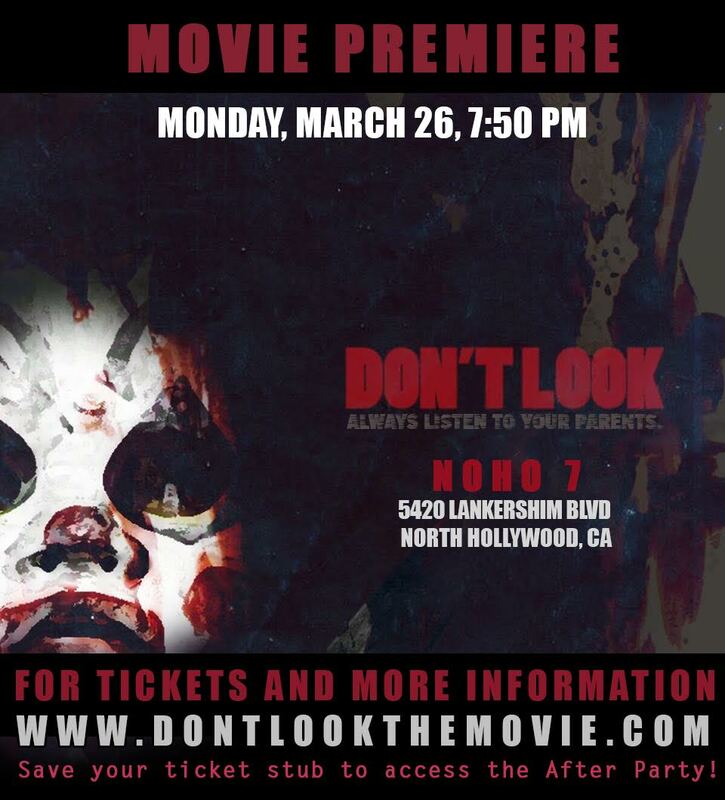 South American Premiere of "Don't Look!" Don't Look it's an official selection for the Rock Horror in Rio Film Festival! Screening dates coming soon! Check out the festival teaser! Attention Horror Fans: ‘Don’t Look’ Needs You! Have you been pining for the days of classic suspense horror? How about a scary thriller in the tradition of an American slasher? Well then you are in luck because right now there is a project called Don’t Look that is homaging all of these qualities and it needs your help! A atriz brasileira Luciana Faulhaber é uma das produtoras executivas do filme de terror Don't Look (ainda sem tradução para português), que será rodado nos Estados Unidos e falado em inglês. "Make all emails, messages, and phone calls personal," Luciana says; "people are more likely to engage and help when they feel personally accountable." Likewise, make yourself accountable for commensurate gratitude. "You really can't get your project of the ground without their help. Make sure they know that."